Are records getting a little too popular?, as this article from the New York Times seems to suggest? Big-box retailers like Best Buy, Walmart, and Urban Outfitters don't understand crate digging in the least. But the appearance of records in stores like these confirms that vinyl record sales are on the rise - even if they are a little cliche. I would prefer to shop elsewhere. 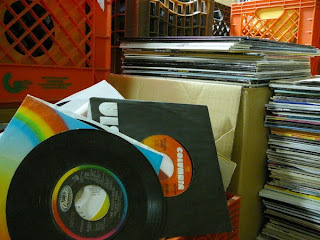 Record shows and fairs are examples of events where one can find rare records. I've been to only a few of them, but it's hard not to walk out with something. I would have liked to attend this recent record show in Brooklyn. In a city as diverse as Brooklyn, New York, one could only imagine what rare records may be unearthed! I am sure it would put any record shows I have seen in Wisconsin to shame in terms of the diversity and quality of the records. It's definitely on my bucket list to attend a few record shows in Brooklyn. You can check https://blog.thesocialms.com/engage-facebook-interaction-brand/ for records reviews and other articles on vinyl. It's an interesting blog that will answer your questions.